Take a trip into the incredible world of Tom Petty with one of the finest tribute shows in the Midwest. Petty Theft KC is a tribute to Tom Petty and the Heartbreakers. A favorite amongst fans, this show covers a large demographic enjoyed by all generations. From the vocals to the layered guitar melodies, harmonicas to harmonies and everything else that makes up the great sounds of Tom Petty and the Heartbreakers, Petty Theft KC is a crowd-pleasing experience. 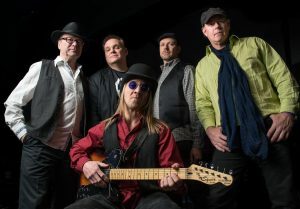 Petty Theft KC is comprised of five professional Kansas City area musicians that have come together to pay tribute to Tom Petty and the Heartbreakers. Since the bands inception in 2010, Petty Theft KC has been entertaining Tom Petty fans in clubs, private parties and on large festival stages with their captivating live show. Petty Theft KC delivers Tom Petty’s songs true to the originals and inthe spirit of his legendary performances. Petty Theft KC has built a strong reputation and loyal following as one of the Midwest’s premier tribute bands. If you want to see the greatest Tom Petty and the Heartbreaker’s tribute band, then come see Petty Theft KC. Tom Petty and the Heartbreakers belong to a special class of artists, a class comprised of those few acts that have sustained decades-long careers despite the restlessness of popular music’s audience. The Heartbreakers’ tours are among the most successful in the business, year after year. Together for some three plus decades, they have scored major hits in every one of those decades. They’ve earned 18 Grammy nominations, entry into the Rock and Roll Hall of Fame, and prestigious lifetime achievement awards from Billboard, MTV, ASCAP, and other organizations. Petty Theft KC provides the Tom Petty & The Heatbreakers exsperience like no other in the country. We look forward to preforming at your event,club,or party.